Patented by Omron, the pre-formed arm cuff expands to fit both regular and large sized arms (9in to 17in) to ensure more comfortable, accurate readings. 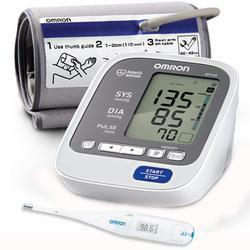 The Omron® 7 Series Upper Arm Blood Pressure Monitor (BP760) provides you with comfortable, accurate readings by ensuring you are using a cuff correctly sized for you. BP Level Indicator - Shows how your reading compares to international recognized guidelines for normal home blood pressure levels.